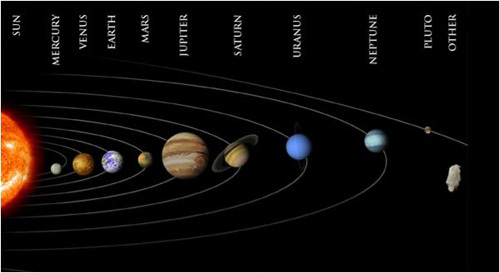 What is the order of the planets in our solar system? Use one of these tools to easily learn this and you’ll never forget it again! The first letter of each word gives you the first letter of the planets, in order: Mercury, Venus, Earth, Mars, Jupiter, Saturn, Uranus, Neptune, Pluto. *In 2006, a committee of astronomers elected that Pluto should not be classified as a planet. They considered how there are dwarf planets such as planet UB313 also known as Eris; and Pluto has certain similarities with that ‘dwarf planet’ classification rather than ‘planet’ classification. Murky conVention’s Efforts Mar *Series; Jury Set yoUr Next *Planet *Chart *Abridged. *The asterisk in this mnemonic is used in places to emphasize the dwarf planets’ words. “Captain Aquarro picks artillery targets, General Canfield leads village liberation," Scotty said. Captain! All de Rigging Seems Properly Polished using Cast-off BeetleJuice!